It is the policy of the South Carolina Society of Professional Engineers to promote, support, and encourage the continued professional development of engineers. To this end, the Engineer of the Year Award was established. The Engineer of the Year Award is the highest award given to an individual by the society. It may be given annually by SCSPE to an engineer who has made outstanding contributions to his or her profession, public welfare and/or mankind. The winner of this honor may then be the SCSPE nominee for the NSPE Distinguished Service Award the following year, if all NSPE requirements are met. It is the policy of the South Carolina Society of Professional Engineers to promote, support, and encourage the professional development of young engineers. To this end, the Young Engineer of the Year Award was established. 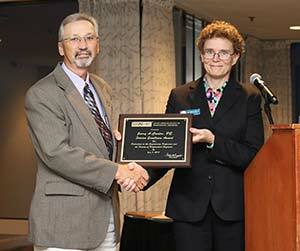 SCSPE may select annually an outstanding young engineer. The recipient of this honor may then be the SCSPE nominee for the NSPE Young Engineer of the Year Award the following year, providing all NSPE requirements are met. Jerry A. Carter, PE, was recognized with the Service Excellence Award by the SC Society of Professional Engineers at the Awards Banquet at the Hilton Myrtle Beach Resort. Carter, active in the engineering communities in several states, brought his volunteerism, leadership, and enthusiasm to South Carolina. As Vice President and office leader of Vaughn and Melton Consulting Engineers, in Spartanburg, SC he continues his leadership in his company and in engineering organizations. He was among a small group that reenergized and reorganized the SCSPE Spartanburg Chapter where he served two terms as chapter president. Continuing to serve, Carter was just elected to serve as the SCSPE’s secretary/treasurer. He has also been active in the American Council of Engineering Companies of South Carolina serving as its Chair, National Director, and Political Action Committee leader. Carter served in various leadership roles in both Kentucky and North Carolina Societies as well. Carter has been with Vaughn & Melton Consulting Engineers for 41 years starting his career in Kentucky then moving to its North Carolina office and now managing the South Carolina operation. He has both a B.S. and M.S. from the University of Tennesse. “Jerry Carter’s dedication to the engineering community and his service to the Society of Professional Engineers is what we look for in every member of the Society,” said Executive Director Adam B. Jones. The SC Society of Professional Engineers honored Paul V. Kumler, PE, with the Service to the Profession Award at the Awards Banquet at the Hilton Myrtle Beach Resort. Professionally, this engineer has spent his career in aviation working for Cessna Aircraft Co., Lockheed Martin, and Boeing before opening his own consulting company, KTM Solutions. Kulmer is a member of the South Carolina Guard, Engineering Command, and Greenville Rotary Club and has served on the board of Goodwill Industries Foundation. He is an advisor to the Greenville Technical College, Engineering Graphics Department. As a member of the SC Department of Commerce’s South Carolina Aerospace group, he is working with SCDOC to develop strategies to increase the aerospace business sector. The primary goal is to develop a preferred ecosystem for aerospace in South Carolina. Kulmer’s company, KTM Solutions, partnered with the Apprenticeship Carolina to develop the first mechanical design apprenticeship in the state, which is recognized by the Department of Labor. Approximately 30 students have participated for at least one semester. This program is perhaps the only formally recognized Mechanical Design Apprenticeship program in South Carolina. He is active in Grace Church in Greenville where he is a Bible teacher and a founding member of the Legacy Business Advisors Board which is a group of seasoned businessmen and women who provide free career consulting and advice. Kulmer is a Louisiana Technical University graduate with a Bachelor’s in Mechanical Engineering. He is a South Carolina registered engineer. Past President Angela Musselwhite, PE, F.NSPE received the designation of NSPE Fellow on June 8, 2018 at Carolinas Engineering Conference and Trade Show. The NSPE Fellow membership was established in 2000 to honor those active Society members who have demonstrated exemplary service to their profession, their society and their community. Since its creation more than a decade ago, less than one percent of all NSPE members have advanced to this highest volunteer membership rank. Musselwhite, a graduate of Georgia Tech has spent the majority of her career with S&ME in the Geotechinal & Materials field, where she’s mentored many people, and pushed them to not only be members of the Society but to be active members of NSPE and SCSPE. She served the Charleston Chapter as Treasurer, Secretary, Vice President, and President. Though she was a major part of the Charleston Chapter, she moved to Greenville last year and is now a member of the Piedmont Chapter. Musselwhite has been active on the state level for the better part of a decade as Director for two terms before becoming an officer. She served on the executive committee finishing as president in 2017. She finishes her term as Past President on June 30, 2018, but always giving back she was sworn in as SCSPE NSPE House of Delegate’s member for 2018-2020. She has also served NSPE. 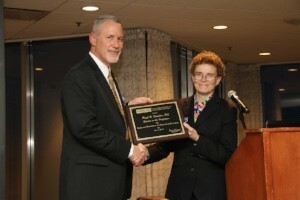 This year she served as the NSPE by chairing the Candidate Screening Committee. Musselwhite serves her community and profession. She’s a founding member of the Charleston Chapter of Engineers without Borders, a member of ASCE SC Chapter, and is active in the Geotech world of engineering. She also finds time to give back by volunteering with habitat for humanity and other civic groups. 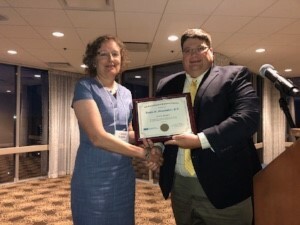 “Angela is exactly what NPSE is looking for when it comes to a Fellow, and it was my pleasure to bestow to Angela S. Musslewhite, PE the designation of F.NSPE,” said NSPE South Eastern Region Director Shannon Looney, PE, F.NSPE.